Proclaim is a legal case and practice management software offered by Eclipse Legal Systems. It has received endorsement from The Law Society and it is not difficult to see why. The application can integrate a slew of functions such as file and document management, reporting, accounting, time recording, and more into one system, eliminating the need for other solutions that could serve the same functions. With Proclaim, legal organizations can streamline their work process, automate tasks, manage risk and complains, and ensure that critical data remain intact. This has enabled the solution to become a complete and flexible software, thus law firms and organizations can scale the application as they expand their business. Furthermore, Proclaim’s interface is configurable, thereby affording users the ability to design the way they want. With this, they have a solution that works for them and adapts to their workflow and not the other way around. Proclaim is an application based on the cloud, so barristers and other legal staff can access data anytime as long as they are connected to a network. This enables them to perform tasks and keep themselves up-to-date with cases even while they are out of their offices. This way, they are able to save time catching up and spend more time resolving cases. Proclaim is a truly configurable system that adapts to a firm’s or organization’s needs seamlessly. They are able to customize data fields, the interface’s appearance and more so they have a software that they can work with comfortably and molded according to their own preferences. With this, staff can increase their productivity as they are navigating a system that is familiar to them. No matter the size of an organization or firm, Proclaim is a great solution. It is scalable and can adapt to the expansion of a business. Therefore, they can continue using the software even when they have blossomed from a small firm to large firm. Proclaim eliminates the manual performance of many tasks so barristers and other legal workers can focus their attention instead on client relationships and business development rather than on administration. Aside from that, the application also allows users to produce documents with a click, thereby cutting the document production time and eliminating repetition. With Proclaim, partners and managers can monitor their employee’s activities and productivity. With this, they know what tasks are being performed and why and to ensure that the most critical jobs are being done. Proclaim keeps users in-the-know with its reporting function. They can pull data from broad choice of elements so they are able to access information they need swiftly. Moreover, they can even set up this function to automate report generation and transmit these to a set list of contacts. Proclaim enables users to communicate with their colleagues, partners, and clients directly from the system’s interface. They can choose from a broad range of options that are convenient to them and to their collaborators and clients. 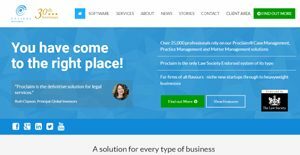 If you are considering Proclaim it could also be sensible to investigate other subcategories of Best Law Practice Management Software gathered in our database of SaaS software reviews. Each enterprise has different wants and requires a software that can be customized for their size, type of workers and clients, and the specific industry they are in. For these reasons, no software can proffer perfect functionality off-the-shelf. When you search a software product, first be sure what you want it for. Read some Proclaim reviews and ask yourself do you desire basic features or do you want complex features? Are there any industry-specific features that you are searching for? Get the answers to these questions to assist your search. There are plenty of elements that you need to reflect on and these include your finances, particular business needs, your organization size, integration needs etc. Take your time, use a few free trials, and finally zero in on the app that offers all that you want to boost your organization efficiency and productivity. How Much Does Proclaim Cost? We realize that when you make a decision to buy Law Practice Management Software it’s important not only to see how experts evaluate it in their reviews, but also to find out if the real people and companies that buy it are actually satisfied with the product. That’s why we’ve created our behavior-based Customer Satisfaction Algorithm™ that gathers customer reviews, comments and Proclaim reviews across a wide range of social media sites. The data is then presented in an easy to digest form showing how many people had positive and negative experience with Proclaim. With that information at hand you should be equipped to make an informed buying decision that you won’t regret. What are Proclaim pricing details? What integrations are available for Proclaim? If you need more information about Proclaim or you simply have a question let us know what you need and we’ll forward your request directly to the vendor.